The New River Gorge National River is a unit of the United States National Park Service designed to protect and maintain the New River Gorge in southern West Virginia. Established in 1978, the NPS-protected area stretches for 53 miles (85 km) from just downstream of Hinton to Hawks Nest State Park near Ansted. New River Gorge is also home to some of the country's best whitewater rafting. The focus of this rafting is in the New River Gorge from the Cunard put-in to the Fayette Station take-out. Snowshoe Mountain is a ski resort located in Snowshoe, West Virginia, in the Allegheny Mountains. The resort is located in the bowl shaped convergence of two mountains, Cheat and Back Allegheny, at the head of the Shavers Fork of the Cheat River. Snowshoe is home to the second highest point in the state and the peak elevation for Cheat Mountain, at Thorny Flat, which reaches 4848 feet (1478 m) above sea level. Harpers Ferry National Historical Park is located at the confluence of the Potomac and Shenandoah rivers in and around Harpers Ferry, West Virginia. The park includes land in Jefferson County, West Virginia; Washington County, Maryland and Loudoun County, Virginia. The park is managed by the National Park Service, an agency of the U.S. Department of the Interior. Originally designated as a National Monument in 1944, the park was declared a National Historical Park by the U.S. Congress in 1963. Blackwater Falls State Park is located in the Allegheny Mountains of Tucker County, West Virginia, USA. The centerpiece of the Park is Blackwater Falls, a 62-foot (19 m) cascade where the Blackwater River leaves its leisurely course in Canaan Valley and enters rugged Blackwater Canyon. It is among the most photographed venues in the state and appears on calendars, stationery, advertisements of all kinds and, most famously, on jigsaw puzzles. The River is named for its tannic acid-darkened water. 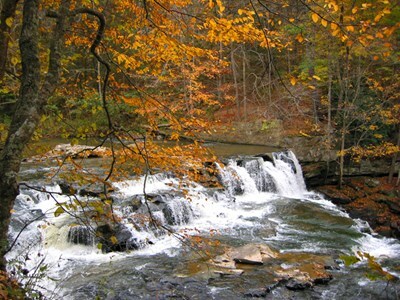 The Monongahela National Forest is a national forest located in the Allegheny Mountains of eastern West Virginia, USA. It protects over 919,000 acres (3,719 km) of federally-owned land within a 1,700,000-acre (6,880 km) proclamation boundary that includes much of the Potomac Highlands Region and portions of 10 counties. The MNF includes some major landform features such as the Allegheny Front and the western portion of the Ridge-and-valley Appalachians. Berkeley Springs State Park is a state park located in the center of Berkeley Springs, West Virginia. The centerpieces of this park are the spa facilities. These waters are currently and historically billed as having medicinal or restorative powers, generally taken internally for digestive disorders or in baths for stress relief. Native peoples visited these springs as did George Washington. The National Radio Astronomy Observatory (NRAO) is a Federally Funded Research and Development Center of the United States National Science Foundation operated under cooperative agreement by Associated Universities, Inc for the purpose of radio astronomy. NRAO designs, builds, and operates its own high sensitivity radio telescopes for use by scientists around the world. Seneca Rocks is a large crag and local landmark in Pendleton County in the Eastern Panhandle of West Virginia, USA. It is easily visible and accessible along West Virginia Route 28 near U.S. Route 33 in the Spruce Knob-Seneca Rocks National Recreation Area of the Monongahela National Forest. One of the best-known scenic attractions in West Virginia, the sheer rock faces of Seneca Rocks are a popular challenge for rock climbers. Cass Scenic Railroad State Park is a State Park located in Cass, Pocahontas County, West Virginia. It consists of the Cass Scenic Railroad, an 11-mile (18 km) long heritage railroad that is owned by the state of West Virginia. The park also includes the former company town of Cass and a portion of the summit of Bald Knob, highest point on Back Allegheny Mountain.